Cancer patients and survivors thrive in a safe haven. “It’s always something.” That was the signature line of Saturday Night Live’s Roseanne Roseannadanna character during the “Weekly Update” skit from 1977-1980. We all have our “something.” For millions of people in the United States that something is cancer. June 5 is National Cancer Survivors Day, a day when these millions of people who are living with or have had cancer celebrate life. To be a survivor is more than just staying alive. It is finding the physical, emotional and mental strength to overcome the massive obstacle of having cancer. According to 2010’s American Cancer Society’s Cancer Facts and Figures, there were an estimated 103,340 new cancer cases in New York in 2010. As this number represents only the patients, countless other people affected by the disease are in need of support. When I was diagnosed with papillary thyroid cancer in November 2010, I, like many other cancer patients, denied my condition. I tried to go about my life as though the diagnosis never happened. Eventually, I found that the big “C” word was too much for me to bear. That’s when I decided to seek support. Many cancer support groups and resources exist in Manhattan. But the brilliant comedian Gilda Radner, who played Roseanne Roseannadanna on SNL, popped into my head as a person to offer me support. I was born in 1986, the year Radner was diagnosed with ovarian cancer. She passed away three years later. Though I was too young to know what the actress was like, I live in a world influenced by her legacy and her struggle with cancer. As a result, I decided to call Gilda’s Club of Manhattan following my diagnosis. Agatha, of Manhattan had a similar experience after she was diagnosed with cancer. After speaking with friends and trolling the Internet, she found that Gilda’s Club was on the top of every list of support services. 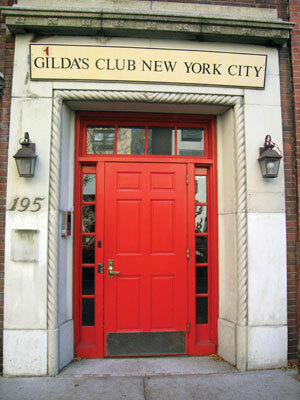 Set up by Radner’s husband Gene Wilder and her psychotherapist Joanna Bull, Gilda’s Club of Manhattan opened its clubhouse in 1995. Since then, programs, workshops and support groups have served more than 5,000 individuals at the Manhattan location as well as at satellite locations in the Bronx and Brooklyn. The moment I stepped through the trademark red door in Greenwich Village, my preconceived notions of what cancer looks and acts like were denounced. The new member meeting showed how people’s cancer experiences vary. I sat with the wife and daughter of a man whose body was riddled with cancer. There was a man who was recently diagnosed with Stage 4 lung cancer. Then there was me— the girl diagnosed with what most doctors deem an “easy” cancer. At first I felt like a fool. However, I was taught at Gilda’s Club that cancer is cancer. Regardless of how easily cancer is treated or how deadly it may become, the club is always open. Led by licensed social workers and group facilitators, groups allow members to delve into issues they face, from the emotional and mental burdens of cancer to medical and personal victories, which are scarcely discussed outside of Gilda’s Club support groups. Topics addressed at support group sessions permit people to break boundaries like how much an individual can help himself and how much friends and family can help. From my experience, there is only so far loved ones can take you on the road to recovery because there are aspects of an illness that can’t be understood from the outside looking inward. While a support group should be just one facet in a support network, it has been a key component in the recovery and survival of many patients, including myself. Networking groups and lectures give members the opportunity to share valuable information regarding other aspects of cancer, namely the medical, financial and legal ramifications of a diagnosis. When members need additional tools, workshops allow for self-discovery, creativity and relaxation. Then there’s Noogieland, which offers a great opportunity for kids who have a parent or family member with cancer, or who have been diagnosed themselves. Children and adults alike give Noogieland rave reviews. Licensed social workers and volunteers oversee programming, play sessions, crafts and other activities at Nooglieland that build support in a jovial environment. Beyond interactive activities, members also enjoy the newly renovated library that houses informative books and pamphlets about specific cancers, healthy diets and recovery. An Internet-connected computer allows members to access further information. The whole of Gilda’s Club is greater than its parts. The groups, workshops, events and resources have helped thousands of people in New York City. Yet, it’s the atmosphere that volunteers and staff have created that has truly made the clubhouse a safe haven for everyone living with cancer. For more information on Gilda’s Club of Manhattan or to become a member, log onto gildasclubnyc.org or call (212)647-9700.